Salmon tastes great and it is cooked in different ways across the world. If you are looking to invite your relatives and friends to your place for a dinner party then smoked salmon can be the perfect choice. One of the most commonly used preparation methods for salmon is smoking it in a smoker. Luckily, you do not have to be an expert to prepare this type of salmon. By following simple instructions, you can prepare tasty salmon for you that can be used as appetizer, snacks or a main course for a meal. Preparing salmon in a smoker takes two to three days and it is recommended to be patient to smoke the fish perfectly. Firstly, consider adding 12 cups of water, one cup of brown sugar, five crushed garlic cloves, one cup of salt and ¼ of teriyaki in a large mixing bowl. It is recommended to use a metal bowl for better results. Once you have prepared the brine, add five to six pounds of salmon fillet in to it and marinate for at least 12 hours. Now use a strainer to remove the brine while saving the crushed garlic as this will be needed later on. Use clean and cold water to rinse the fillets. Let the salmon fillets dry with a paper bowl. Now consider brushing the garlic onto the salmon fillets, allowing them to sit at room temperature for a couple of hours. Pour some vegetable oil on the racks of the smoker you are going to use to smoke the salmon. It is recommended to put vegetable oil on the skin side of salmon to avoid sticking inside the smoker. Set the temperature to 223 degrees and put the fillets onto the racks with skin side down. Allow the salmon to get cooked for at least a couple of hours. 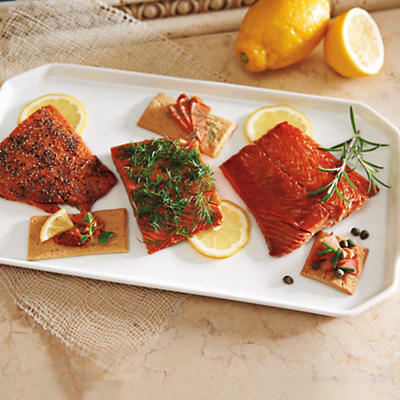 Now use ¼ cup of apricot brandy and ½ cup of apricot jam as you apply it on both sides of salmon fillets. Put the fillets back onto the racks and cook for an additional half an hour. Remove the fillets from the smoker and let them cook to room temperature.